The Goodies – This week’s highlight (well, kind of) is that the release of the RFP for the $20 million in state investment in small business development was not released this week as I stated last week. Stay tuned! Data Collection Demystified, A Webinar – Today! Register for Data Collection: Make the Case for Funding and Get It Right From Intake To Reporting – today – Thursday, July 19, 2018, at 2:00 pm. The webinar is right in time as the FIELD’s microTracker census opened this week! Earlier this week, a friend posted gratitude to the volunteer fire department (including her husband) who held the line of fire on the corner of her property and thus saving her house and her animals. 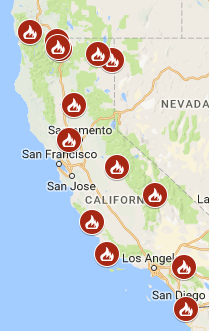 If you look at the California fire map, 13 active fires are burning in areas where many of you serve. Preparation is key to a quicker recovery – which is now familiar to some of our members who lived through last year’s devastating fires. Read more about “The Role of Business Assistance in Disaster Recovery Efforts” on our website. While you’re there, read last week’s blog post – “Prosperity Now’s 2018 Scorecard: A Look At California’s Metro Areas” – a look at Los Angeles, San Francisco, San Diego, San Jose. State legislators are in the district until August 3, 2018. A bill that concerns us is working its way through the legislature. On the surface, SB 1235 is a great bill – a truth-in-lending bill for small business loans. However, along the way, it was amended in a way that will confuse small business borrowers as to their financing options, not make them more clear. We are meeting with the author of the bill to see if he will entertain amendments and to bring it back to being a great bill. The outcome of that meeting will determine what our exact strategy will be, but for now, we are asking you to contact your assemblymembers today or tomorrow and set up a district meeting with them. Once you have, let us know and we will send you talking points and background information. Good news on policy: The Governor signed AB 1785 (Nazarian) Medi-Cal Eligibility, a bill which will exclude the principal and interest of a 529 savings plan in asset or resource tests to determine eligibility for Medi-Cal benefits. State Funding Update: The release of the RFP for the $20 million in state investment in small business development was not released on Monday, July 16, 2018, as I stated last week. Stay tuned! Free Webinar: The Federal Reserve hosts “Opportunity Zones: Understanding the Potential of the new Community Development Tax Incentive” to drive long-term equity capital to distressed communities by providing tax benefits on investments in Opportunity Funds. Job Opportunities: Cutting Edge Capital, Santa Cruz Community Credit Union, Los Angeles Latino Chamber of Commerce, Loconomics, Small Business Majority, Alameda County SBDC, Renaissance Entrepreneurship Center, Greenlining, and Accion San Diego are hiring! Please check CAMEO’s job page for more information and other listings.